California jewelry designer Irene Neuwirth will launch a new limited edition fragrance in collaboration with Barneys New York. The Irene Neuwirth scent follows previous Barneys fragrances for L’Wren Scott and Greg Lauren. The scent was "inspired by Neuwirth's memories of summers at the beach as a girl" and her love of Coppertone. Notes for the beachy white floral include neroli, orange flower, jasmine, rose, coconut, vanilla and musk. 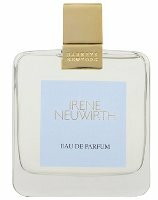 Barneys + Irene Neuwirth will be available in 100 ml Eau de Parfum, $195. Just had a reading comprehension fail and combined the “B” in Barney’s with “Neuwirth” to immediately conclude that Bebe Neuwirth is launching a scent. When I realized that’s not in fact the case, I was disappointed. Random, I know, but I love Bebe Neuwirth, and it’s funny to me that I would be kind of excited if she released a perfume. I am sorry. That would have made me happy too. I had the exact same split-second reaction, and I was excited, too. lol. I want to get it just for the bottle. Don’t know what it is about it, but I love it. Curious to see what others will think about the scent. It seems like it will be amazing. It’s pretty pricey to buy just for the bottle! I’ll have to check it out the next time I go to Barneys. It’s still too cold to walk there and I am too cheap to pay for the bus (well, because it is normally just a 12-minute walk from the office). 12 minutes is too many minutes to be outside right now!